A male is known as a MALE, a female is known as a FEMALE and a baby is known as a CRIA (Spanish for baby). A group is known as a HERD. The ears are rather long and slightly curved inward, characteristically known as “banana” shaped. The feet are narrow, the toes being more separated than in the camels, each having a distinct plantar pad. The tail is short, and fibre is long, woolly and soft. The fibre is extremely delicate and soft, and highly valued for the purposes of weaving, but the quantity which each animal produces is minimal. LONGEVITY: Llamas can live up to 30 years. WEIGHT: They weigh between 130 and 200 kilos. SIZE: Can grow up to 6 feet tall. 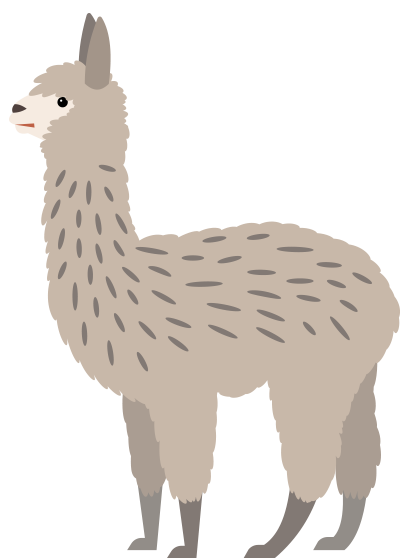 DIET: Llamas are herbivorous animals that participate in grazing and browsing activities. They love grass. GESTATION: The gestation period of a llama is 11.5 months. 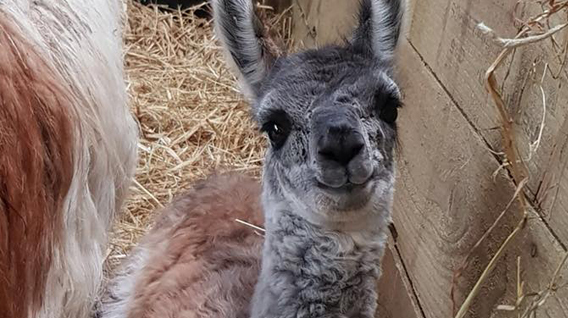 Female llamas do not lick off their babies, as they have an attached tongue which does not reach outside of the mouth more than half an inch. Rather, they will nuzzle and hum to their newborns.